Sensei Steve Cole, 5th Dan, Swindon Jikishin, issued his annual invitation from the Swindon Club, which we accepted with relish. Hanshi Brian Herbert, 8th Dan, Chief Instructor, Jikishin, led us, which included Senseis Chris Sheppard and Ricky Izod, 6th Dan, Colin Humbles, 5th Dan, Trevor Wickett, Grant Wakeman, 4th Dan, Tony Park, Andy Jones, Wayne Williams, 3rd Dan, Gareth Jones, 2nd Dan, Jon Oliver-Fitch, Sean Parker, 1st Dan. 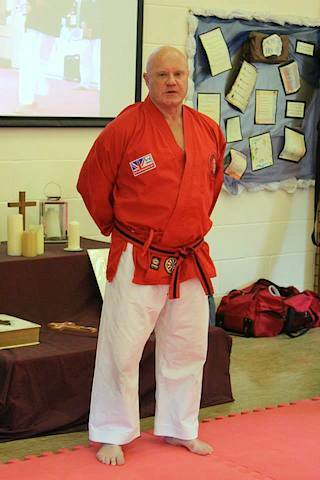 Sensei Steve welcomed us in having come from Cornwall, Essex, North East Essex, Kent, London and Brighton. He also passed on the Regrets from Sensei Baj Bharj, 5th Dan, who was unable to travel back from Saudi in time for the event. Supported by Senseis, Dave Gadd, 3rd Dan, Kevin Palmer and Simon Taylor, 2nd Dan and a host of adult and children students, Sensei Steve opened the Event by asking Hanshi Brian to say some Words of Welcome; in short, this was Thank You for supporting the Event, Enjoy the Day, Have Fun. 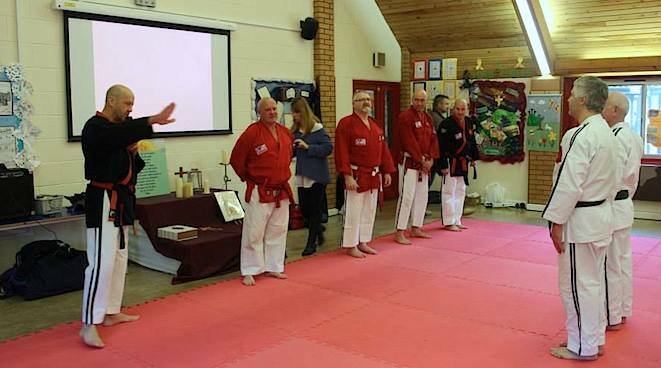 We split into 2 groups with the Adult Black Belts adjourning to the large mat area at the back of the school, with Kyu Grades and children on separate mats in the main area. One delight of the Oliver Tompkins School is the design feature that allows sunlight to permeate the building. This also allows a sense of space enhanced by its high V-shaped ceiling. Following Hanshi Brian’s invitation to Sensei Grant to lead the Warm-Up, we quailed as we embraced the punching and bobbing drill, which called for a sense of dexterity some of us found ‘challenging’; the more-so as he increased the tempo, which for him was seamless and smooth; for us a mite more, er, ‘discombobulating’. Read that as ‘disorganised’. He repeated this for the afternoon session yet few realised that he was carrying a notable injury to his knee; an extraordinary example to us who knew but quite normal for Sensei Grant. Sensei Ricky opened on the Dan Grade mat and quickly dazzled with Simple Technique with an Escape for Rear Strangle; except this one is not in the syllabus. This was built on by another Escape, in which Control was taken of the Attacker’s Wrist leading to Strikes and Throw. He moved onto to Grab and Punch, this time facing the Uke. This led to quick and sharp Control through compression on the thumb. Sensei Colin, as Uke visibly winced – so did we when we came to practise it although my scream of pain might have been heard in the Town Centre. Yes, it was a bit of shock from such an innocuous movement by Sensei Ricky. 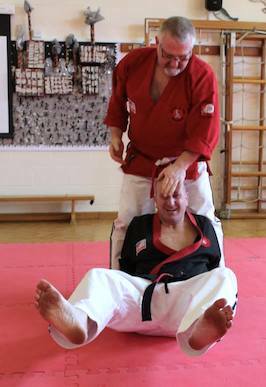 Hanshi Brian rotated onto the mat with Sensei Andy Jones, 3rd Dan, as Uke. In this, Hanshi illustrated a Take, Deflect and Back-fist as a response to a punch from Sensei Andy. This moved through further Distraction Strikes into a thoroughly Locked-Out Andy. A wonderful technique, and one to admire. Hanshi then moved into Escape from Single/Double-Leg Takedown. In this, he showed a Simple Escape that made me laugh because I didn’t see it until he’d executed it. You see? 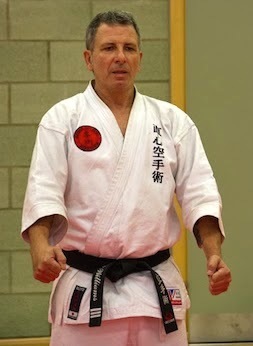 “Simple” does equal “Easy”, rather, it shows understanding at a high level, hence Hanshi made it look easy. He then built on this by showing a Finish. Hanshi Brian then showed a Standing Locking Set in which he took Control of Sensei Andy and worked through numerous Locks as Hanshi moved from Right to Behind to Left of Andy. This was worth the price of admission on its own. Wow. Sensei Chris took over and showed a Simple Escape from Double Wrist Grab. This was a joy and would work superbly with younger students who would be enthralled by such simplicity. You’ve realised by now that it was also subtle and clever. There were a number of evolutions that Sensei Chris worked through and these appealed to the adult students. At one point, Sensei Colin and your writer both ended up on the mat in a supine position being rocked ‘back and forth’ we had been balanced so well. We could do nothing about it. For the afternoon session, Sensei Steve took the adult mat and demonstrated a move that really appealed to me. I can’t do it. So, that’s an aspiration to me and hopefully it will emerge one day. He was able to receive a Punch, Take, then, well, sort of, turn in-under-around and his Uke ended up on the mat. He also ended up in Serious Trouble but you knew that. As we did more in this vein, Sensei Dave Gadd took over and drew on his Dan Grade Judo background to get us to impart Movement to an uke and so overcome his Inertia in getting him to move and then countering to execute a Throw. If you have to read that twice, that’s quite OK. Better yet, go to Swindon Ju Jitsu and learn for yourself. Sensei Dave will gladly teach you. 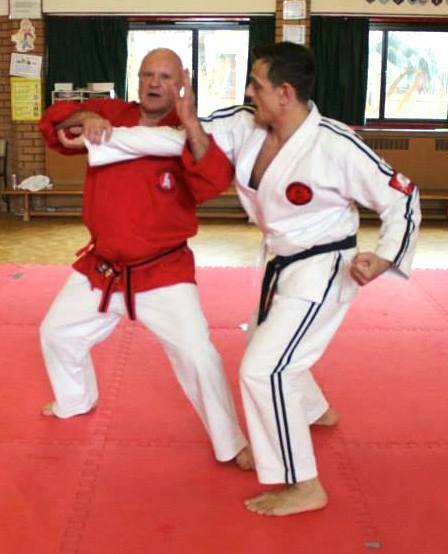 He was followed by Sensei Kevin Palmer and Sensei Simon Taylor demonstrating and teaching Ground-fighting. Sensei Kevin called on his BJJ training to show ‘Spider Guard’, well, that’s what it looked me to me as I hurried to another mat; it was a busy day. As the afternoon session progressed, Sensei Grant demonstrated use of Cane. However, he decided to do this from the Ground (mat) with your writer as Uke. Suffice to say that he was able to turn me into the Mat (Face Down) as well as away from him and so ending up Flat on my Back on the mat. This was clever but well within his skill-sets as he also has a Black Belt in Cane. Excellent training for when you collect your Pension. This gave way to Sensei Wayne Williams, who drew on his extensive knowledge of Kata, which he shared with a keen student group. Sensei Wayne used Sensei Andy as Uke as he demonstrated Kata Form and then deconstructed to help us understand the component parts and how they fit together. In one such lesson, he demonstrated a Block-Take-Strike which worked superbly and seamlessly. What he also demonstrated to us, if we were sufficiently alert, is how he moved as unit and carried his Weight with his striking hand. This was all-important and easy to miss. He showed this Technique on both Left and Right Side and both Insider and Outside. More followed, which this writer found enthralling. I took Weapons to help Sensei Gareth, Laurie and Simon through 1st Sai, 2nd Sai, 1st Nunchukas, 2nd Nunchukas and Bo Pairs. All this while the 2 mats were full of children engaged in competition and seminar work with the emphasis on Fun. All too soon Sensei Steve called us all together for the Medals ceremony in which the children were awarded their Gold, Silver and Bronzes medals won in competition and also as souvenirs for attending the course. After some words of Thanks from both Sensei Steve and Hanshi Brian, the Course w as formally closed. However, it was not quite the end of our visit because Sensei Steve had arranged a communal dinner in a local Chinese Restaurant in the Main Thoroughfare. It was Buffet style and superb. Apart from 3 visits to replenish his plate, Sensei Colin asked for a Guinness and was impressed to receive a bottle of 8% proof. He didn’t so much as pour it, as treat it like a bottle of tomato sauce, to encourage it out of the bottle and into his glass. We moved on to public house in the near vicinity, well, next door really and spent the rest of Evening talking, laughing, joking (not necessarily in that order) until it was time to go and say our Farewells to our Swindon Friends. It was a Great Day and is now an Annual Event so we look forward to reassembling next year, in 2015. 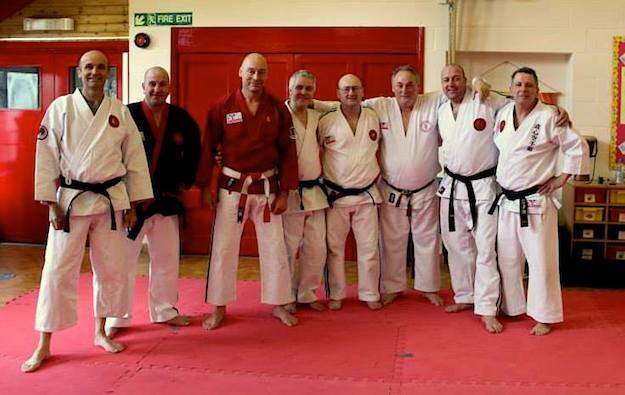 Thanks to Sensei Steve and the Swindon Club for making us feel so welcome.